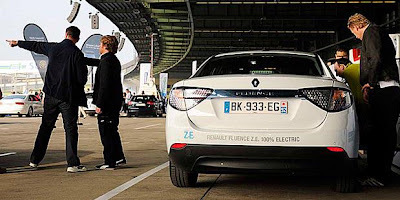 - Renault Zoe reached #1 in France and also presumably in Europe as a whole, making it the first time it reached the pole-position, just like the Volvo V60 Plug-In did in Sweden. My last trip was to Switzerland, one of the few countries in Europe where it's usual to see V6 and V8 powered cars running around the streets, and there i spent some time looking for EV's. 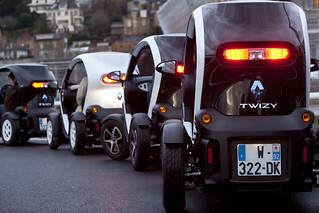 When i said that to my swiss colleagues, they looked at me in a strange way and said: "EV's?!? But...Why?...You don't have by any chance a Prius, do you?". When i asked why, they answered me: "Well, here in Switzerland they say that the Prius is for gays..."
Mitsubishi I-Miev - The first EV i saw was a I-Miev in the Geneva Airport running around between lanes and airplanes and if you come to think of it, it's a smart use for EV's, small distances, low speeds, it's like a electric car heaven. The second (and last) car i saw from the I-Miev family was also a company car, so...No private sales here. Opel Ampera - The one i saw apparently was a private car and after making a remark that the Opel had a plug, the guy that was with me said: "Wow, nice!...It doesn't look like an electric car!". When i asked him about how an electric car looks like, he answered: "Well, you know...Small, slow, flimsy...". An out-of-this-world performance of the Citroën C-Zero in February allowed the german EV market to disguise the sales drought that has been suffering in the last months, in fact the 253 units sold by Citröen (Probably a fleet deal, does anyone know what happened here? ), not only established a record sales month for this model but it also allowed it to jump from fifth to number one in the YTD sales, and with enough distance to keep it there for a few months as well. Plug-In sales in the Netherlands is going down alarmingly, in February sales were down almost 50% regarding the month before and some 70% if we look back to last November. In this gloomy outlook, the only model that isn't underperforming regarding last year's sales is the Chevrolet Volt, up one position to #2 and gaining on last years monthly average (25 units). As for the rest of the competition, their performance varies from bad (Opel Ampera, Renault Twizy...) to very bad (Fisker Karma, Fluence ZE). Already with a massive 79% Plug-In Hybrid share in 2012, this year the EV dutch market continues to prefer this kind of electric car, increasing even their market share by 3% to an incredible 82% share. Down to #2 in February but still ahead in the YTD sales, the 288 February sales kept the Kangoo ZE way ahead of the Nissan Leaf, in #3, with just 63 cars sold in that same month. Down the ranking, notice the Twizy down three positions to #5 and the french cousins of the Mitsu I-Miev also down, respectively 4 (Peugeot iOn) and 5 positions (Citröen C-Zero), and on the upswing we find the Smart Fortwo ED, 4th in February and 6th YTD, versus a discrete #11 in 2012. From a monthly average of 138 EV's sold last year, now spanish sales are down to only sold 60 units until February, 28th, falling even more than the general auto market there and originating a EV share drop from 0,24% to just 0,04%. The economic crisis is all over the newscovers these days there, so it's natural that people there have other priorities, right? With 70 cars sold until the end of February, the danish EV market is keeping last year's pace, although this can easily change in the future. Leader in 2012, the Renault Fluence is suffering with the Better Place business problems, leaving the title of best-selling model to the Nissan Leaf, celebrating a second consecutive month in #1. Despite being the second largest EV market in the world, it is difficult to get regular sales numbers from Japan, but here's an exclusive ranking for January's Plug-In car sales! We can see that the duel between the Prius Plug In and the Leaf now has a small advantage for the Nissan's car, now benefiting from the improved 2013 model. But the big news is the arrival of Mitsu's Outlander to the market, in just 16 days it got 506 sales, a whole lot more than its stable mates I-Miev and Minicab did in a complete month and about half of what the top two sold. 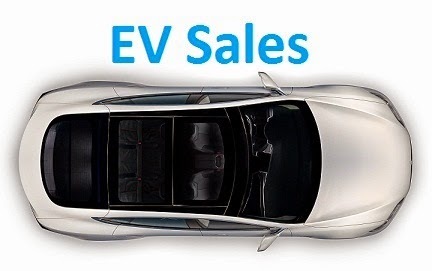 With 5.419 units sold in February, the EV market in the US-of-A saw a 18% increase over last month and, most importantly, a 200% plus increase year-on-year, showing a consistent growth that outshines the efforts across the pond in other countries, making the US responsible for over half the sales of plug-ins this year. All models contributed for this sales growth, with one of them (Mitsubishi i) even registering a record month at 337 units. The Chevrolet Volt recovered the number one place but with Tesla selling consistently over 1.200 units a month, it will have to return to October levels (Over 2.000 sales) if it wants to keep comfortably the best selling crown. Behind the front two, the Prius Plug In seems to be losing steam and is now threatened by the Nissan Leaf, that is starting to be benefited by the Tennessee production and with it expects to increase sales in the coming months. In fifth comes the Mitsu i-Miev, relegating to a surprising #6 the C-Max Energi, struggling for now with a small inventory. Finally, we welcome the Fusion Energi with a respectable 119 sales in its debut month.